Jon Peterson's (Playing at the World) educated guess is that today is the 40th anniversary of Dungeon and Dragons. A person's life has several key moments, some more important than others, marriage, birth of a child, death of a parent or loved one for example. The other key moments are not quite as important but still define us in important ways and for me it was my introduction to Dungeons and Dragons in the fall of 1978. I first became aware of Dungeons and Dragons when of all things I was teased for not knowing about it. The person mocking me waved what I now know to be an ODnD White Box. It was the summer of 1978 and I was just out of 6th grade. All I could was mutter "Yeah I already know about!" and walk away. Around that time, I had a friend named John and we played a lot of hex and counter wargames together. Not only DnD was about to ignite a fad craze it was also the highwater mark of wargames with companies like SPI and Avalon Hill leading the way. Somehow the two of us managed to get a hold of a Holmes Boxed set. The first game involved him refereeing the Porttown Dungeon and me playing a magic-user. The adventure was very short as my Magic-User went downstairs, turned to the right, found a room with four skeletons. I fired a magic missile and didn't even take down one. I tried to game my way out with the Holmes' parry rule but ultimately my magic-user took too many hits and went down. That game ignited my passion for Dungeons and Dragons. Prior to playing I was an avid fan of the Lord of the Rings and read my older brother's copies several times to his annoyance. One of the things I loved about the Lord of the Rings was the Return of the King appendices. I quickly realized that Dungeons and Dragons was not only an interesting game but it allowed me to write my own RotK appendix and actually do something with it. I quickly wrote my own setting and still have a faded posterboard of it. One of my few regrets is that I didn't manage preserve the folder I had of it. I took a previous version of that posterboard and detailed the setting in a series of letter size maps using quarter inch graph paper. In the winter of 1978 and 1979, I learned a lot more about Dungeons and Dragons as it was played extensively at Boy Scouts. At that time we used camp grounds with winter cabins. With the cold and dark coming early there was a lot of time in the evenings to play. Years later I was able to use one of those sites when I was involved in running boffer LARP events. My friend John and I split the $15 cost of a ADnD Players Handbook. One of the things we were eagerly looking forward to was being able to go beyond the third level cap of Holmes. Alas the Players Handbook didn't have the combat charts. We had the wait until the fall of 1979 before we got a hold of the Dungeon Master Guide. Afterwards there was no stopping us. I still remember calling State Street Models daily to see if the book was in. Then begging my dad to drive me down to get it. The ADnD DMG was and still is a marvelous RPG book. Also at that time my grandfather passed away. With all the changes that occurred I was allowed to bring the coin bank that I kept at my grandparents. From when I was 6 years old to around 12 I managed to save nearly $150. With 1970s prices I was able to buy all the DnD stuff I wanted. I also discovered Judges Guild and liked a lot of their material. That allowed me to stretch my bank even further. In the fullness of time my passion for Dungeons and Dragons led to me meeting my oldest friends, Tim and Dwayne. It lead me into NERO and boffer LARPS where I met my wife, Kelly Anne. Then around 2007 the circle closed and I was back to running Dungeons and Dragons as my main game. Not only running the game but publishing for it. Through this I met Ken, Chris and J Squad at Gold Star Anime. While I can't say Dungeons and Dragons is the most important influence on my life, it had a profound, lasting, and positive impact. So here to 40 years of Dungeons and Dragons. To the memories of Dave Arneson, Gary Gygax, and to all their friends that supported them. And here to 40 more years of Dungeons and Dragons. This weekend I ran the first game of the new year in my long running Swords and Wizardry Campaign at Gold Star Anime. When we last left off of our intrepid party they found three elves chained in the lowest level of Tegal Manor. After examination, Heimdell, the dwarven runecaster, determined that they fueled the magic being channeled through the manor and causing all the weirdness. After a short debate the party elected to free the elves. Freed of their chains they thanked the party with their last breath and died. At which point the Manor started collapsing. Heimdell use Dimension Door to get the party out. They lugged the bodies of Faramir, a human knight, and Hazar, a human thug and the official owner of Tegal Manor back to Goodnap where they raise the two at the Cathedral of Mitra. At which point the last session ended. This session picked up a week later with Faramir, and Hazar recovered. Well Hazar halfway recover as he was in anguish over being the owner of a pile of stone instead of a large manor house. After meeting two new party members Argo a human berserker, and Caleb, a human Wizard. A wizard is my version of d20 Sorcerer class translated into my campaign. The party did something shopping and Heimdell worked on some enchantments during the downtime. During this they learned that the civil war being waged in the western lands of the City-State of the Invincible Overlord has now spread to where they are. Then things got weird. First they started seeing the elves they saved alive and well around town. But every time they tried to talk to them they disappeared. In addition in the midst of talking to people they would utter something completely weird like. "The Dark Portal will open. ", "Seek the circle of stone". "At the full moon the way will open". After leaving the cathedral the party settled at the local inn and were contemplating their next move when a royal messenger came in from Dwarven Kingdom of Thunderhold. Apparently his majesty King Nodre Ironhelm wished to reward the party with land and resources for their work in a previous adventure. But Caleb told the party of a stone henge nearby and the party decided to head there. In addition they would reach on the night of the full moon. It took an hour for the party to gear up and as the party were leaving the royal messenger returned with a royal writ commanding the party to immediately leave for Thunderhold to receive their rewards. The group started to debate this when the realized that Thunderhold was two weeks away. When they turned to question the messenger he was gone and the guard and people at the gate acted as if nothing happened. The royal writ they were handed turned out to be a large leaf. Suspecting something very bad was going to happen, they rode to the stone henge. While camped, the party saw a dwarf female paladin being attacked by an ancient red dragon. She ran to the party yelling to save her. In the confusion the party let themselves be bunched up in a group. As the dragon was about to breath on them it and the dwarf female disappeared. Finally the party reached the henge, where they found it to be a interworld portal. Apparently at the full moon it is at is weakest and one can use it to travel between worlds or dimensions. As the party debated over what to do. The three elves from Tegal Manor appeared. They explained that all they wanted to do is reward the party with their heart's desire. If they used the portal they would return to the real world and to the madness of civil war. As the full moon was raising, the party debated. The cleric of Thoth, god of knowledge, told the party of a vision he had of the two faction of the civil war fighting and darkness overcoming both. In the darkness was a black dragon, Ancelgorn the defiler of the Majestic Fastness, the ancient home of the dwarves of Thunderhold. Finally the party declined the elves offer and stepped into the portal. They found themselves in the dungeon of Tegal Manor looking on the bodies of the three elves. This time the manor did not collapse. However with the release of the elves all the weirdness left leaving the Manor as a very large building in the ownership of Hazar. The session ended with the party returning back to City-State. At first it looked like it would be an adventure getting back there with the civil war spreading. But Alia, a human burglar, had stuff a boat into her bag of holding. When this happened a couple of session ago, she was mocked for it but now it came in handy as the party used it to slip pass the opposing forces and sail back into City-State's harbor. One hallmark of my campaigns is that I like to slip in a time travel adventure, alternate reality or similar weirdness. This time I decided to go with the elves trying to "reward" the party by putting them into a enchanted alternate reality. What made it weirder is that when they came out that Argo and Caleb where with them. Two individuals they met in the alternate reality. All the stuff they enchanted or bought came out with them as well. Although nothing that the elves gave them directly like the royal decrees and writs. Everything they learned about the civil war was also apparently true. I am always nervous when running these adventures because with shifting time lines and questions of what is reality things can get confusing. But this seemed to went over well and by the end the party has a definite sense of where they want to go. As promised here the rules for divine magic. The main challenge were allowing cleric to have access to all divine spells but somehow tying the maximum spell level to something in-game. In this case I opted to tie to the skill bonus for Knowledge(Theology). Specific to my campaigns was that cleric/priest got a specific bonus spell at 3rd level. I converted that into a rule that use of the bonus spell is not fatiguing except on a critical failure. Also yesterday I decided at the last minute to write a In a Nutshell section that summarizes the rules as a introduction. I like this idea and place to use it in the other sections of the rules. The character can cast divine spells with a Religious Ritual roll. The higher the spell level is the more difficult the spell is to cast. The character can cast Divine spells where the spell level is equal to or less than his Knowledge (Theology) skill bonus without an additional penalty. Casting is fatiguing and repeated casting without rest will cause the character to pass out. A spell can be cast as a longer ritual without fatigue. With the right aspect a priest can cast a spell as a single combat action. Casting requires a successful Religious Ritual roll based on the difficulty of the spell. Casting is fatiguing unless a critical success or a high degree of success is rolled. In order to successfully cast a spell, the result of a Religious Ritual roll needs to be equal to or greater than the spell level plus one. The level of spell the priest can cast without penalty is equal to Knowledge (Theology) bonus. For example a +3 bonus to Knowledge (Theology) allows the priest to cast up to 3rd level spells. Higher level spells can be cast but the difficulty increases to two times the spell level +1. For example for the above priest to cast a 4th level spell requires a +9 or better result on his Religious Ritual roll. In order to cast a spell, components costing 10d times the spell level squared are consumed. In addition the caster must be wearing or holding his holy symbol. One pound of spell components equals 100d. The casting of spells from memory is fatiguing. Unless there is a +8 degree of success or a critical success (a natural +4). The character must make an endurance check or pass out. Afterwards the character’s endurance is reduced by 1. It takes 15 minutes of rest to regain each point of fortitude. Each deity has one spell that is not fatiguing to cast (except on a critical failure). For example priest of Delaquain, the goddess of honor and justice can cast the 3rd level divine spell, Prayer without incurring fatigue. Any divine spell can be cast as a ten minute rituals. In general Priests can cast any divine spell as a ritual and not incur fatigue except on a critical failure (-4). So after some initial sessions the players would like a different magic system than vancian style spell slots. I would still like to use the wealth of material based on the d20 SRD. So I developed this system to use for the next round of playtesting. This is for Arcane Magic and I will cover Divine Magic in the next post. Remember I am adapting the spell list found in the d20 SRD including the spell levels. For the arts of magic see this post. I am still working on the list of spells and when that done I will post a list of what spells goes into which art. The character can cast any spell found in his spellbook with a Thaumatology roll. The higher the spell level is the more difficult the spell is to cast. Casting is fatiguing and repeated casting without rest will cause the character to pass out. A spell can be cast as a longer ritual without fatigue. Casting spells also require the expenditure of components. Spontaneous magic is more flexible and doesn't require spell books. Learning magic and spell casting are more difficult. With the right aspect a mage can cast a spell as a single combat action. Casting requires a successful Thaumatology roll based on the difficulty of the spell. Casting is fatiguing unless a critical success or a high degree of success is rolled. To successfully cast a spell, the result of a Thaumatology roll needs to be equal to or greater than the spell level plus one. In order to successfully cast a spell, components costing 10d times the spell level squared are consumed. One pound of spell components equals 100d. In order to cast a spell caster must scribe into a special book incantations and rituals of the spell. The cost of scribing a spell into a spell is 100d per level of spell. In addition to the cost it takes a number of days equal to the spell level to scribe the spell in the spell book. The caster must set aside one hour of study per spell level per spell per month in order to cast spells from memory. At character creation the caster buys his initial spells from his character's starting funds. With the right aspect the caster can use spontaneous magic. Instead of casting spells learned from a spell book, the character performs a series of meditations and rituals to memorize and attune to one of the ten arts of magic. This requires 1,000d worth of components and ten weeks of time. Afterwards the character can cast any spell from that art with an additional -4 to his Thaumatology roll. The character can only attune to as many arts equal to his Intelligence score in addition to the Art of the Forge. Starting characters are attuned with one art plus the Forge. Any spell can be cast as a ten minute ritual. In general mages can cast any spell in their spell book as a ritual without incurring fatigue except on a critical failure (-4). For mages practicing spontaneous magic they can cast any spell out of a spell book or any spell in the arts they have learned. Any spell cast from their knowledge of the arts is cast at a -4 penalty. The degree of success of the ritual roll is used as the target number for any required saving throws. For example a mage cast a sleep spell and rolls a +4. Since sleep requires a 2 or better to cast the degree of success is 2. The target now needs to make a will save of 2 or higher. The degree of success is also used in some spell to determine how effective the spell is. Blackmarsh, Southland, and Wild North combined! 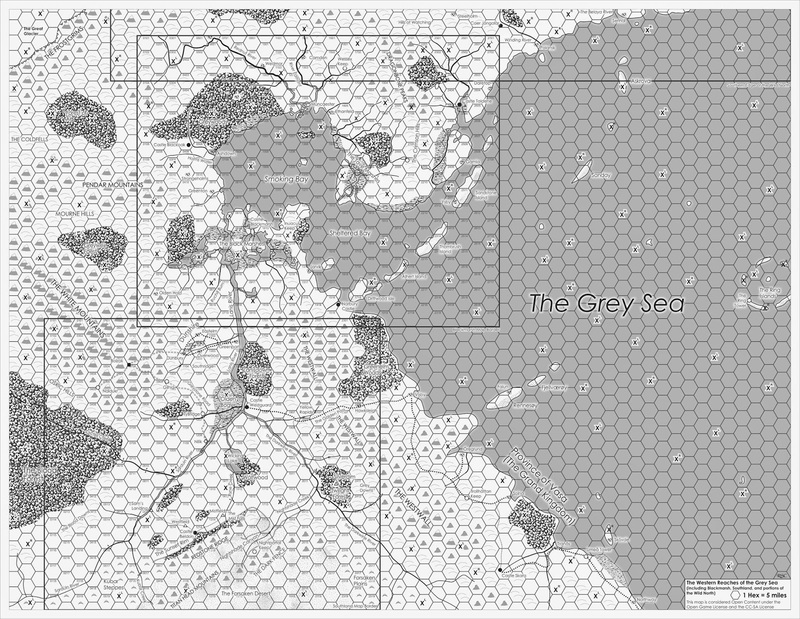 It took me a while but I finished up the combined map of Southland (from Points of Light), Blackmarsh, and Wild North (from Fight On #3). While the Wild North was originally designed to dovetail with Map 5 (Valon) of the Wilderlands of High Fantasy, the southern edge will be redesigned for version 2 and overlap with Blackmarsh instead. The map shows the relationship between all three maps plus added territory. I know there no hex numbers but I decided to leave the Blackmarsh and Southland numbers untouched. The rest is left blank. If you decided to detail it yourself just give each entry a code on a copy of the map and in your notes. Eventually I will expand the sides out to Blackmarsh letter sized maps and those maps will have proper hex numbers. 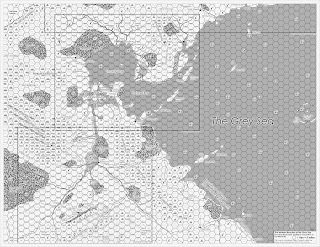 Like Blackmarsh this map is open content and dual licensed under the Open Game License and Creative Commons (Sharelike, Attribution). Click you will see the full size map. The province of Vasa was recently conquered by the Grand Kingdom about 50 or so years ago. It is the strip of land between the Westwall and the Grey Sea. It is the home of a Viking culture now under the heels of late medieval western european style kingdom. Perhaps the Mountain that Fell left debris scattered around the Grey Sea. Perhaps it something else. Maybe you need to ask the denizens of the Ring Tower about it. Once it covered the Wild North but now is in retreat. Or perhaps the malign power that sleep underneath has awaken and is beginning to stretch it's cold claws across the world once again. Blackmarsh lies on the extreme northwest edge of civilization. What lies beyond the Pendar and White Mountains? Is there an end to the orc infested Blood Forest?